Also in the recent years, devoted by Hermanowicz in great part to genealogical research, an element of artistic creativity was playing a principal role. 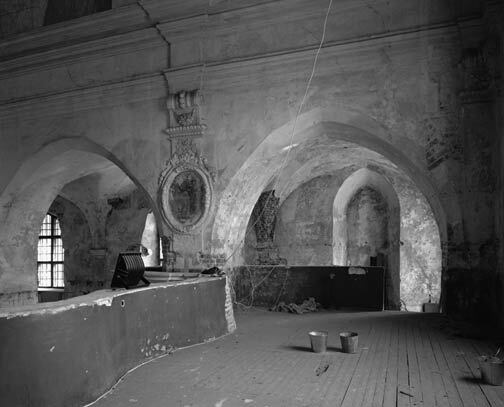 His works made of inspiration of found and described elements of history of his Poland's eastern borderland family and his search for traces of his family's past also everywhere in Europe and even beyond*** came to light thanks to photography. 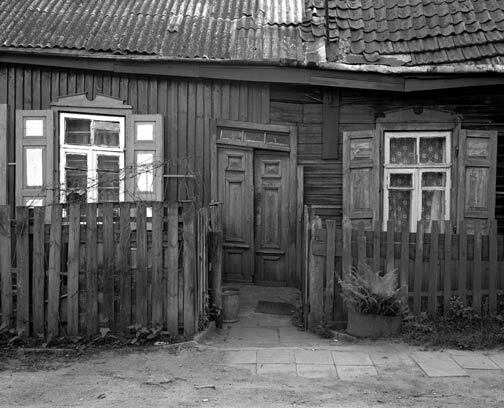 Nevertheless in any case photographs made by Mariusz Hermanowicz are straight recordings of reality. While they are made in the present time they take us into the distant past. These photographs are not submitted to any manipulation or processing. They represent the world we live in realistically and by means of of the artist's comments (handwritten at the bottom of the photographs) they submit this world to multifaceted interpretation. This consistently cultivated since years stylistics (also in a series of special, original realisations for Internet edition of Fototapeta called "Trans-missions") was clearly simplified lately. 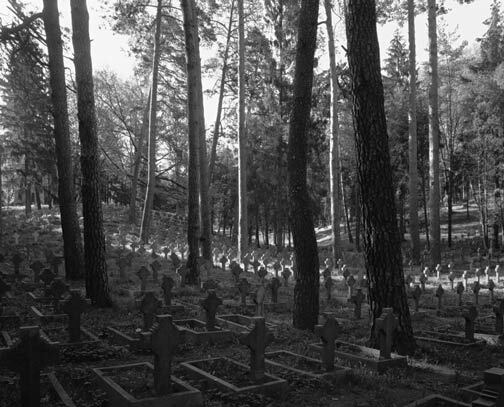 Mariusz Hermanowicz in his series of photographs taken in Vilna during the last two years in fact leaves us alone with his photographs, save for his introductory comment on the whole series. 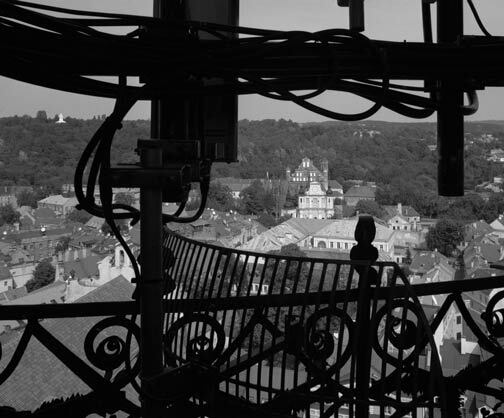 Vilna, the town of special importance for him, to which he relates in very emotional way, is being photographed by him in a classical way with a view camera similiar - as Hermanowicz reminds himself - to cameras of Czechowicz, Bulhak and many other local photographers from the past. This unpretentious, marked with extraordinary careful composition pictures become - for someone who knows works of e.g. Bulhak - a reinterpretation of these old photographs but realised in totally different conditions! 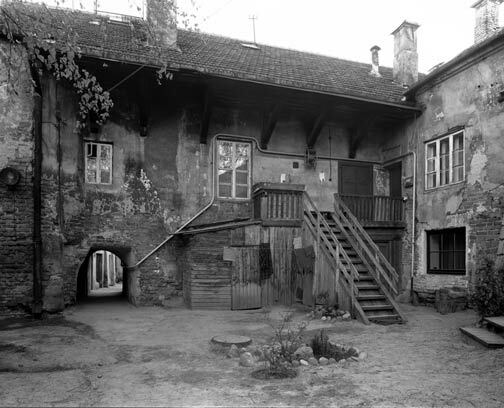 Aparently Hermanowicz did this deliberately and did it in masterly way - these black and white photographs of contemporary Vilna still hold the very magic of this town. 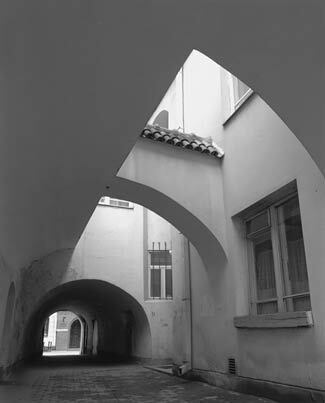 Picturesque alleys and the whole magnificent historical architecture of the town loose nothing in this consistently black and white form. These pictures redeemed by hours long studies on camera setting, finding of proper angle of incidence of sunlight or articulating proper motif are marked with a powerful authenticity and sui generis simple elegance that should be associated with straightforwardness of completed task. 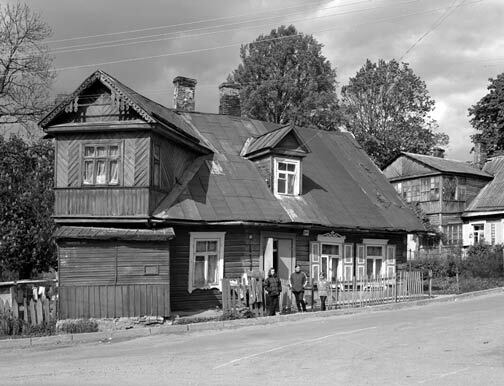 During days long, tiresome and even exhausting peregrinations with heavy equipment through Vilna and its environments Mariusz Hermanowicz carried out a peculiar description of how this town looks like at the treshold of the third millenium. This very personal description is important not only for the artist himself, as he admits it is, but also for all to whom good photography delivers deep aesthetic and emotional experiences. * Mariusz Hermanowicz had his first exhibition in the Mala Gallery in 1979. 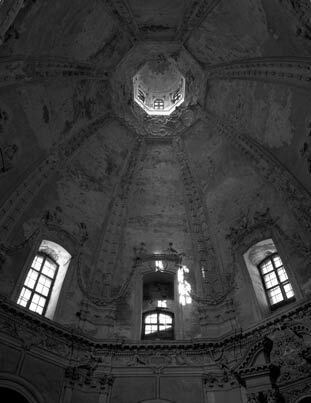 ** Mariusz Hermanowicz was a curator and participant of the exhibition "Sociological photography" in Bielsko-Biala in 1980. *** In 1999 and 2002 Mariusz Hermanowicz visited Chile where he studied archives of Domeyko family of which he is a direct descendant. Vilna, the town of my parents' young days. Also the lives of many of my other ancestors were connected with this town and this region. I was born in a town lying 350 kilometres away from Vilna, but it was already in different times, when the Soviet Union still existed. Then these 350 kilometres were difficult to pass. I travelled to Vilna on old maps and old photographs. I could stroll down the streets of Vilna in my imagination only. It was not before 1995 when I arrived in this town for the first time. From this time on I used to come back to Vilna frequently. The main purpose of my travels to Lithuania and Belarus was gathering of materials for my "Book of Ancestors", my opus magnum which perhaps I will be able to finish one day. Of course I was taking photographs in Vilna. These were pictures taken to enliven my memory, more or less the ones all tourists take. But I never dared to make Vilna a subject of some series of my pictures. My photographs were always in a way "special", with captions, assembled in series, perhaps not avant-garde but also not traditional. To photograph some town, to make its "portrait" - it was not an idea of my style. 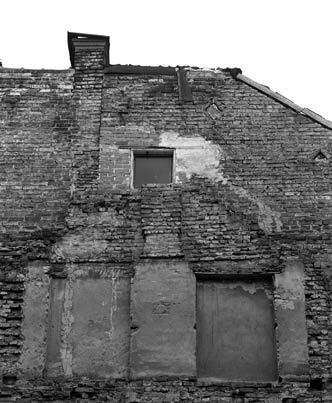 To tell the truth I did once a series called "10 years" which I devoted to Olsztyn, the town of my young days but it was done in a very subjective way. 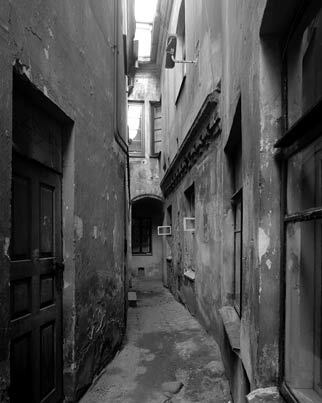 Apart from that - to photograph the city that was photographed by Czechowicz, Bulhak? One has to to have nerve. Or even more so, to be very humble. 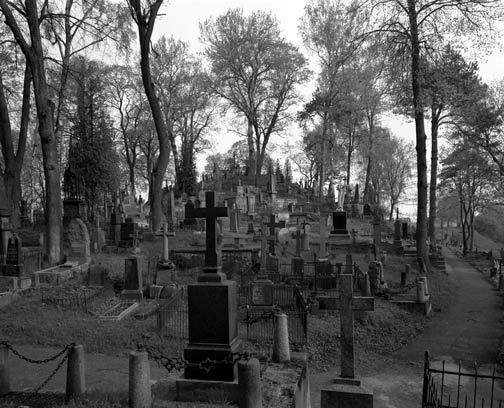 Nevertheless, when I was in Vilna in 2000, when I was walking down its streets I was becoming more and more familiar with, unexpectedly a thought came to my mind, the thought that I would like to come back here and stay for a longer time (so long as my employer allows me at one time, i.e. for one month) and to photograph this town for my own pleasure. To photograph everything I love here and to take it with me so no one ever could take it from me. I experienced moments of very intensive happiness while getting up everyday at daybreak, walking through Vilna to and from, setting up my camera, taking pictures. Nobody can take it away from me too. After returning back home I processed films and ... put them to a box. They stayed there for a good few months. Why I was not able to print them immediately? I do not know. Maybe I was over-saturated with Vilna. Perhaps I needed to gain some distance. "Gaining distance" is a very difficult period. Possibly I was afraid. I knew after all that these photographs would not be as good I dreamed about them to be. I knew that looking at prints I would not feel this trembling I felt so many times while setting up my camera. If Marek Grygiel would not shake me out from this state by setting the time for the exhibition these negatives could still stay in the box as well. In the time of writing (early March 2002) I still do not know which pictures I will present. Supposedly it will be "the first act", the first "lifting of lid" of my box with negatives from Vilna. I would like to dedicate this exhibition to my friends from Vilna - Ruta Vitauskiene and Kestutis Stoskus. It would be much more difficult to take these pictures without their help and taking some of them would be simply impossible.